Where to live in Spain: Barcelona v Granada .. Let´s kick off! If you are thinking of moving to Spain and wondering where to live in Spain, it is always interesting to hear what other expats living in Spain have to say about areas they have lived in. 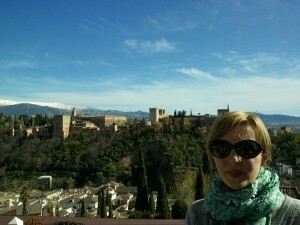 In this post, Molly, who writes for our Newsletters and her own website www.piccavey.com , gives us her thoughts, both positive and negative, on living in Barcelona and Granada. If you read my post about Spain winning the World Cup, you will know that I am a bit of a football fan. So for a bit of fun, as it is currently Euro 2012 football frenzy season, we have decided to play this as a game of two halves… who do you think will win? 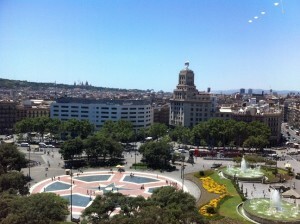 So, let´s kick off with what´s great about Barcelona… over to you, Molly! Well it´s certainly looking as though it going to be a close match!. Both cities have so much to offer whether it be a holiday destination or a place to choose your home. For 9 years I lived in the city of Barcelona. It is a place with many advantages and that´s exactly why a lot of expats have settled in the city or near to Barcelona. The offer of Cultural activities is enormous. With great theatres and concert venues whether you are into Jazz, alternative scene, commercial music, Barcelona has it all. It is also a good place for museums, exhibitions and art too. The only dates in Spain that Madonna offers in June 2012 are 2 nights in Barcelona. To find work in Barcelona is easier than some other Spanish destinations as there are Jobs for European candidates in Multinational companies. The atmosphere of the city is laid back and the people are generally open minded. There is a clear cosmopolitan, European vibe to the place. I feel that Madrid feels more traditionally Spanish than Barcelona does. I always notice that the way people dress in Barcelona is more relaxed than other places, not so formal. I regularly wore smart jeans and trainers when I lived there, I find it is easier to get on if you fit in where you live. In the south people dress up and wear make up all the time, it´s more formal. I´m wearing heels most days in Andalusia and sometimes miss the laid back vibe of Barcelona. Massive offer of Flights from Barcelona, National and International destinations. Good connections from Airport to city with taxis, buses and trains. The shopping is fantastic. A huge variety of food at places such as Boqueria market, international food can be found easily in the city. Buying clothes is great as most international brands are on offer somewhere in the city. There are also many outlets to be discovered, Mango has an outlet shop there (just off Diagonal) and then you can take a bus ride to the enormous La Roca Village too from Sants bus station. The climate in Barcelona is balmy almost all year round. There are only about 6 weeks is cold weather. Some flats don´t even have central heating. July-August is really humid and sticky but generally warm temperatures for the rest of the year make it a great place to be. Public transport is excellent. Underground, trains, buses, taxis. There even beaches in the city than can be accessed by bus or underground. You can actually ski and sunbathe on the beach on the same day. The ski resort is about 40 minute drive from the city and the beach is a similar distance away at Motril or Salobreña. I find it really easy to mix with the locals and get on here. People are generally friendly. I love that I can walk everywhere. Distances between things are small. In Barcelona or Madrid as it takes 45 minutes to get anywhere the day flies by, as here it takes just 10 minutes to get practically anywhere in the city you can fit many different activities into one day. It´s like time stretches further here. The climate is great. In winter it is really cold. That crisp fresh cold. In summer it is red hot but not sticky. In the shade it is bearable. We have a proper summer and a proper winter. Spring and autumn seem to be barely noticeable. I think that the cost of Rent and the house prices here are good value when looking at other places. 170,000 euros could buy you a new basic 3 bedroom home with shared swimming pool and garage at the moment. Rent here would be around 600 euros for 3 bedroom apartment in the city. To me here every day feels like the weekend. People are in the restaurants most days; the streets are always busy with people. People are out at night in the week, not just at weekends. So, as the first half comes to a close, who do you think is winning? If you were thinking about moving to Spain, which would you prefer to move to, Granada or Barcelona? We look forward to receiving your votes and comments. Join us for the the second half, HERE. 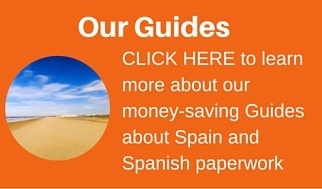 If you are thinking about the Malaga province or Costa del Sol, read the article HERE. Read our thoughts about the best place to live in Spain HERE.